FRESH INVENTORY! 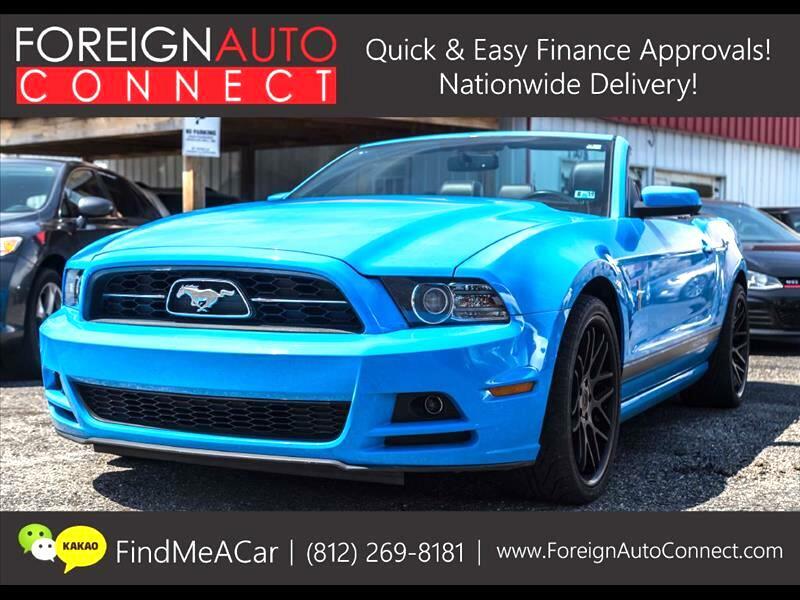 CLEAN CARFAX - NO ACCIDENTS - NON SMOKER - RARE GRABBER BLUE EXTERIOR COLOR - 2014 FORD MUSTANG V6 PREMIUM CONVERTIBLE! EXTREMELY CLEAN INSIDE/OUT, RUNS & DRIVES GREAT WITH NO MECHANICAL ISSUES! Visit Foreign Auto Connect online at www.foreignautoconnect.com to see more pictures of this vehicle or call us at 812-269-8181 today to schedule your test drive. We reserve the right to end this listing at anytime should the vehicle no longer be available We reserve the right to end this listing at anytime should the vehicle no longer be available for sale. The following terms of sale apply to all of our listings. Payments: We only accept cashiers check, bankers check, ACH wire, or cash as a form of payment. IF buying through an online platform a deposit of $500.00 US FUNDS by Credit Card (AMEX, VISA, MASTERCARD) must be paid within 24 Hours of the close of the listing. When the deposit has been submitted, "Buyer" MUST fax or email a copy of their valid, state- issued driver's license. The remaining balance must be paid within 7 Days. If payment is made by cashiers check we will hold all titles for 10 days or until funds have cleared. Buyers that come in store may leave a deposit on a vehicle to put a vehicle on hold for a max 7 days, which is non-refundable unless prior notice is given with proof of financing delays or if the vehicle has any major issues mechanically or cosmetically occur during the 7 day hold. Taxes and Fees: "Buyer" is responsible not only for knowing their own states' laws regarding taxes and fees, but also remitting the proper taxes, fees, and documents for their state. All taxes and fees must be paid in full in order for the vehicle to be titled and registered. DEALERSHIP HAS A $295.00 DEALER FEE WHICH INCLUDES; TITLE & MAILING, PROCESSING, 45 DAY TEMP TAG. SHIPPING IS DEPENDENT UPON FUNDS CLEARING. CUSTOMER IS RESPONSIBLE FOR ALL TAXES ,TAG FEES AND SPECIAL REQUIREMENTS AND EQUIPMENT FOR VEHICLES LEAVING THE UNITED STATES OR THE STATE OF (enter State of dealership's location). DEALER RESERVES THE RIGHT TO END THE AUCTION EARLY IF THE VEHICLE BECOMES UNAVAILABLE FOR WHATEVER REASON. ALL OF OUR VEHICLES ARE FOR SALE ON THE LOT. WE RESERVE THE RIGHT TO SELL THE VEHICLE OFF THE LOT AT ANY GIVEN TIME DURING THE AUCTION. GENERAL TERMS AND CONDITIONS SECTION Questions: Please feel free to contact us directly at (812) 269-8181 any time with any questions you may have. Odometer Readings: Due to demo test drives and mechanical inspections, the mileage of the vehicle represented might be slightly different than the mileage stated when the vehicle was first listed online. Financing: For help in arranging financing or for any questions regarding financing options, please contact us prior to bidding. We offer International Financing provided by a third party lender source, NO SSN. NO US Credit is Required. Buyer's Inspection: We do our best to disclose all information known about our vehicles. We welcome a Buyer's Inspection. If you plan to have a Buyer's Inspection, please make sure you have the vehicle inspected prior to the end of the auction. Inspection fees, if any, are the "Buyer's" sole responsibility. We only allow inspections to take place on the dealership's premises and the inspector must be accredited and insured. Title Information: Vehicle titles may be held by banks or lenders as collateral for loans. In many cases there is a delay in receiving the original instruments of up to 31 days from the time we pay a vehicle off. While we usually have all titles in our possession at closing, there are occasions where we may be waiting for them to arrive, in such case, the buyer will be provided an Dealer Title Affidavit State Form 46633. Finalizing Your Purchase: For auction bidders, Winning bidder MUST communicate with us by e-mail or phone within 24 hours of the end of the auction to make arrangements to complete the transaction. If we cannot confirm your intention to buy within 24 hours or the sale is not completed within 5 days, we reserve the right to re-list this vehicle or sell to any other qualified buyer. Before the vehicle is released for shipment to the "Buyer", all sale-related and title-related paperwork must be signed and returned completed to the "Seller". Shipping and Delivery: All shipping charges are the "Buyer's" responsibility. Licensed "Carriers" are generally insured for $3,000,000.00. We assume no responsibility for damages incurred after the vehicle leaves our showroom. All shipping arrangements provided by us are strictly a courtesy. We are not affiliated with any carrier. Any claims or other communication regarding shipment of vehicles will be between you and the "Carrier" and not with us. The amount of time it takes for delivery depends upon the "Carrier" selected. A typical experience is 7-14 days from the date the vehicle is picked up from our facility until it is delivered to your destination. Verify with the "Carrier" for an Estimated Time of Arrival to be sure. Please understand that weather conditions, traffic, accidents, & other obstacles during transit can affect time of delivery. Warranty: Unless stated otherwise, this vehicle is being sold "as is". Manufacturer's warranties may still apply. An extended warranty may also be available. Please contact us for details. No representations or warranties are made by the "Seller", nor are any representations or warranties relied upon by "Bidders" in making bids. Misprints, Typographical errors, and Calculation errors: While every effort has been made to ensure display or accurate data, Foreign Auto Connect isn't responsible for misprints or typographical errors in equipment or pricing. Misprints and Calculation errors occur, so please inquire about all options listed prior to visitation. Foreign Auto Connect has the right to void a sale at any time if a Calculation error is made on the Bill of Sale, If a sale is voided by Calculation error, Foreign Auto Connect shall offer the customer one of the following 1.) Make the necessary corrections and revisions on the purchase documents. OR 2.) Offer refund and compensation for travel expense if buyer chooses to walk away from the sale. Thank you for viewing our vehicle(s) and we hope to earn your business!